One race today, the Spanish Vuelta Ciclista al Pais Vasco (Tour of the Basque Country). 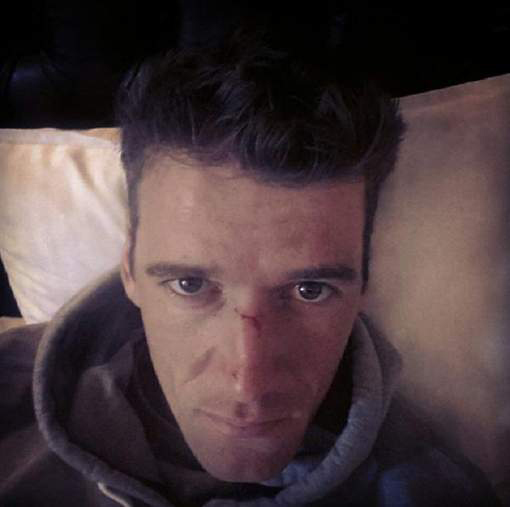 Etixx-Quick Step rider Stijn Vandenbergh had a rough day at the races. He crashed in Sunday's Tour of Flanders, hitting a tree and breaking his nose and then crashing again late in the race, eventually finishing 51st. But the plucky racer is undeterred. He'll be on the line for Paris-Roubaix in a week. It was a hard day for a couple of riders who were hit by the Shimano neutral service cars while the cars were trying to pass them. Trek Rider Jesse Sergent suffered a broken collarbone. He was just finished taking his pull while in the front break when the blue service car hit him while trying to pass the group. Another car hit the FDJ team car as it was slowing to help Sebastien Chavanel. 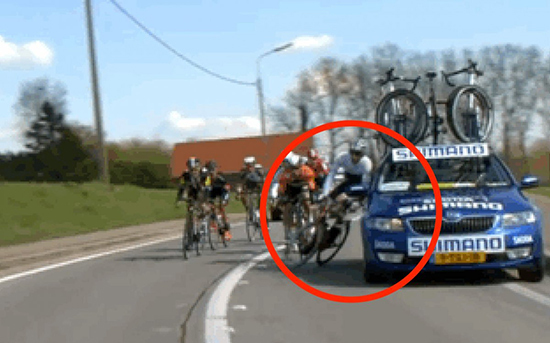 The Shimano vehicle hit the FDJ car which in turn hit Chavanel. Chavanel eventually finished 45th, 3min 33sec behind winner Alexander Kristoff. At Shimano we apologize for both incidents the Shimano sponsored neutral caused today at the Tour of Flanders. We especially apologize to the riders and teams involved, Jesse Sergent of TREK Factory Racing and Sébastien Chavanel of Française des Jeux. We wish them a speedy recovery. The drivers of the neutral cars are professionals with many years of experience in professional cycling races. We will investigate both incidents deeply and take appropriate action. Lotto Soudal set a strong collective performance in the 99th Tour of Flanders. 21-year-old neo-pro Tiesj Benoot made a remarkable debut and crossed the finish line in Oudenaarde as fifth. Jürgen Roelandts claimed the eighth place. Lars Bak was part of an early breakaway and German champion André Greipel didn’t seem to get tired. A front group of seven with Lars Bak was formed after almost fifty kilometres of racing. This breakaway got up to 6’30” advantage on the bunch, where it was mainly Team Sky that took control. On the Molenberg, the sixth hill of the day, André Greipel attacked. Nobody joined him and before the Paddestraat he was part of the bunch again. On the Kaperij Lars Bak took the lead in front, only Damien Gaudin followed the Dane. Also in the peloton there were attacks on that hill, of Stig Broeckx for example. On the Kanarieberg Greipel attacked again and he and Broeckx got in a chase group. Before the second ascent of the Oude Kwaremont, they were caught. On that climb Belgian champion Jens Debusschere came to the front. At the top of the Paterberg it was over for Lars Bak, not much Gaudin got reeled in as well. Greipel obviously felt strong because he jumped away before the Koppenberg. On that climb riders came back, also teammates Tiesj Benoot and Jürgen Roelandts. A group of 25 riders rode to the Kruisberg/Hotond together. On that climb Alexander Kristoff and Niki Terpstra attacked. It turned out to be the decisive move. None of the chasers could bridge on the Oude Kwaremont or Paterberg. Also in the last thirteen kilometres to the finish in Oudenaarde Peter Sagan and Greg Van Avermaet, their nearest chasers, couldn’t close the gap. 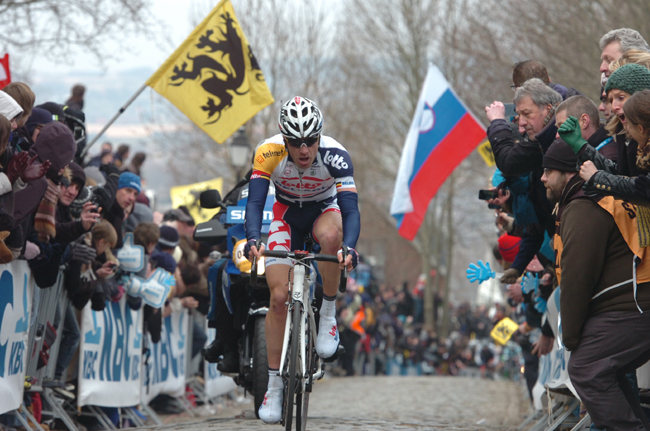 Alexander Kristoff won the 99th edition of the Tour of Flanders. Tiesj Benoot jumped away from the second chase group, which Jürgen Roelandts was part of as well, with three kilometres to go and beat Lars Boom in the battle for the fifth place. Roelandts finished as eighth today. Ronde van Vlaanderen turned into a proper chase, as several groups of favorites went full throttle towards the finish line in Oudenaarde. Tinkoff-Saxo’s team captain Peter Sagan had put in a powerful acceleration on the last ascent of Paterberg but had to settle for fourth behind race winner Alexander Kristoff. After 264km of grueling racing on cobbles and bergs in Flanders, Tinkoff-Saxo’s sports director Tristan Hoffman sums up the race with mixed feelings. However, he notes that Sagan’s near podium miss is a testimony of good shape. “Sagan did a good job today and he was fourth in one of the biggest and hardest races in cycling. He was very close to finishing on the podium, which means that he has the legs, but he missed the very last bit, which we saw on the final 500 meters. I can see that he’s really close to hitting peak shape and we now turn our focus to Scheldeprijs on Wednesday and Roubaix next Sunday”, comments Tristan Hoffman, who saw that the team put in an effort to protect Sagan until the finale: “The guys did a good job and they sat with Sagan during the majority of the race and kept him well protected. Going into the absolute finale, Peter was on his own and he put in the effort at the right moments and rode a clever race”. Ronde van Vlaanderen, Flander’s finest, once again turned into a showdown between the big favorites and stars of the cobbled classics. After several breakaway attempts during the first, tiring 200km, the race entered the finale with two-times up Oude-Kwaremont and Paterberg. Tristan Hoffman explains how the race developed for Tinkoff-Saxo. “After 200km we entered a key point, where the second time up Oude Kwaremont created a big selection in the peloton and the race exploded. Peter Sagan and Maciej Bodnar were in the front group, while the other guys ran out of energy. Sagan was always at the front without exposing himself to the wind, which meant that he could save energy for the final 20 decisive kilometers”, explains Tristan Hoffman. “When we arrived at the foot of Kruisberg, Sagan was alone and Kristoff and Terpstra went off on the attack. 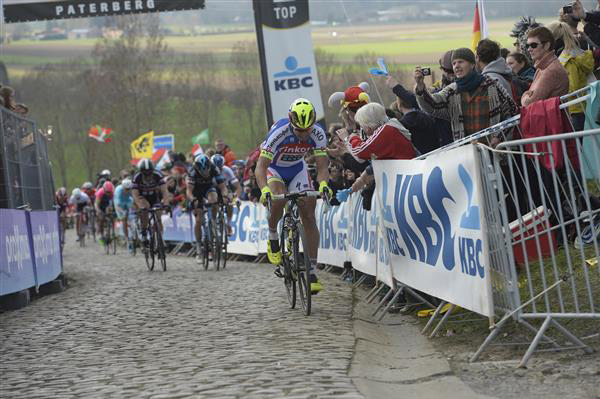 We had hoped that they would come back before the last time up Kwaremont, but they were really strong. Peter saved energy and on Paterberg he went all out in an effort to close the gap. Kristoff and Terpstra worked very well together and in the end, Kristoff showed that he was simply the strongest today”, finishes Tristan Hoffman. Neo-pro sprinter Caleb Ewan has claimed his first professional win in Europe, Spanish one-day race Vuelta a La Rioja today. The 20-year-old rode with the full support of a much more experienced Orica-GreenEDGE lineup to pull off the team’s second consecutive victory at the event following that of Michael Matthews last year. South African teammate Daryl Impey finished second. The win gives Ewan victories on three continents in 2015, following earlier season successes in Australia and Langkawi. “Obviously this is another great confidence booster for me,” Ewan said. Albasini and Meier were amongst the first group of eight riders who looked like establishing the break of the day. Unsatisfied with the combination, the peloton allowed them just 40seconds before reducing it down to 20 seconds. But in a second acceleration, they dropped two companions and survived to re-establish as a group of six at the head of the race. The objective for Orica-GreenEdge was achieved; relieving the remainder of the team from any chasing duties that come associated with defend champions and a team built around a threatening sprinter. The next dangerous move was a solo one by Alejandro Valverde (Movistar Team) who escaped to have a 35second advantage going into the final 20km. Orica-GreenEdge was quick to respond, placing the entire team at the front of the peloton for the catch that occurred less than five kilometres later. The experienced Australian outfit remained at the fore until the conclusion of the race, perfectly setting up the sprint victory.